In 1989 we hosted two young school teachers from Lucerne Switzerland. When they left they told us that if we would come for Fasnacht they would make us costumes. In Lucerne we were given costumes from the previous year's Guggenmusik, a sort of Drum and Bugle Corp which featured many types of percussion and brass instruments. Sybil, our friend, played trombone. The parades, sometimes in formal procession and sometimes just a Guggenmusik group wandering the streets of Old Town Lucerne, featured elaborate costumes topped by large custom made heads--some as tall as three feet on their own. The photo above was taken of a fruit stand which happened to be next to a coffee shop and bakery. Several members of a "Musik" were taking a break from pre-parade rehearsal and took advantage of the empty space on the fruit stand as a head rest. The photo below is the head of the director of an entire group of cats. Lucerne is one of the most beautiful cities I've seen but to see it during Fasnacht is something very special. Some typical photos can be seen at this link. After the large-scale celebrations in Lucerne we traveled to the small farm where Rita and her husband lived. The night of the party Rita and Sybil sat us down to put on facial make-up. We looked in the mirror to see our faces covered in red, white, blue and grey colors. We still had no idea what our costumes would be. Then they brought out the costumes. We were to be "Liberties." The basic costume was a long blue tunic covered with many sizes of silver stars. Over that they draped a diagonal red and white striped cloth and finished the costume with a silver statue-of-liberty crown. Once dressed we went to their small town high school gym which had a stage at one end and was decorated with all manner of streamers and colorful art. The party featured parades of costumes and dancing to a multi-talented dance band playing world music--especially American Rock and Roll from the 60's. 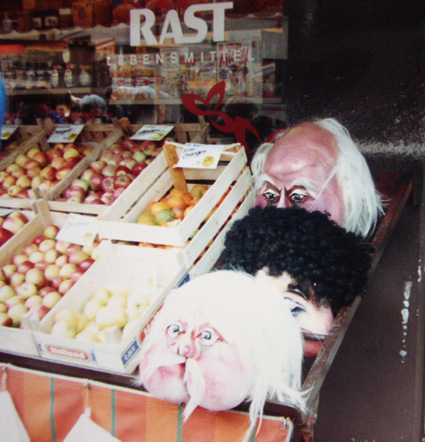 Fasnacht in Switzerland is unbelievable until you experience it.